The ultimate DOT radial drag tire just got better. 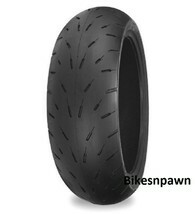 The Shinko Hook-Up Pro Drag sportbike tire has all of the great features of the original Hook-Up, but is lighter, faster, and even better at the top-end of the track. The Hook-Up Pro's competition developed design allows for more horsepower to be used throughout the run due to a larger contact patch at high speed. Enhanced carcass resists distortion, chunking, and the stresses of centrifugal force to maintain a more constant footprint.